Dear Readers, those of you who have been following this blog for a while will know that it hasn’t been the easiest of years, what with the gradual decline in my parents’ health, and the recent decision to admit them to a nursing home. In the aftermath of all this, I find myself vulnerable, as if I’ve lost a layer of skin. The downside is that I never know what will make me cry: an advert on the television, a snippet of an old song, a memory conjured out of nowhere. But the upside is that I am seeing things as if anew. I can be caught by a glimpse of sudden beauty that stuns me into stillness. This can make me cry too, but there is less of despair and loss, and more of hope about it. 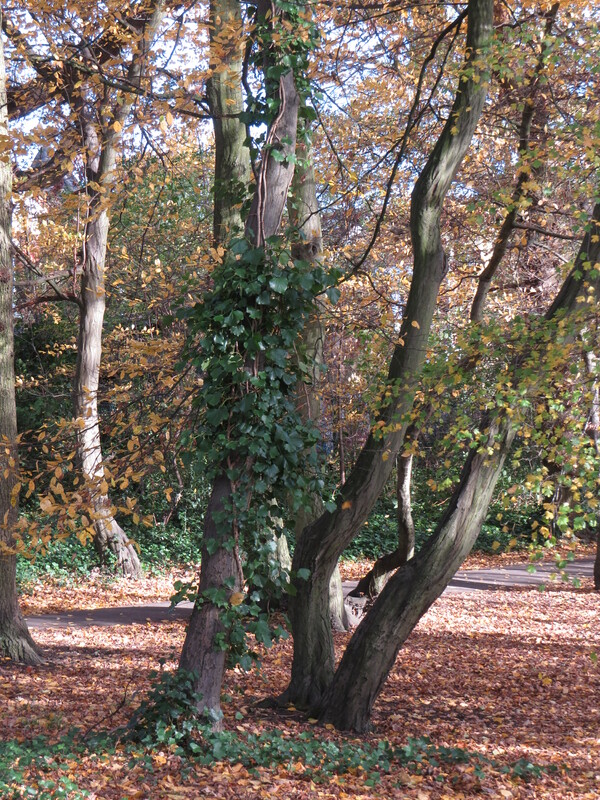 And so I took myself off for a walk in Cherry Tree Wood in East Finchley at this breeziest, sunniest time of the year, just to see what I could see. 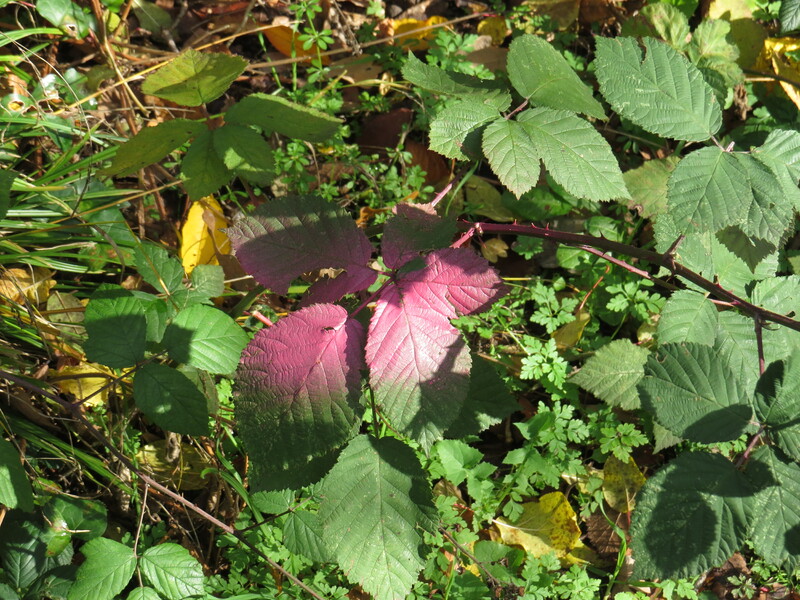 A trio of bright pink leaves caught my eye to start with. Nothing natural here, unless you include the tendency of the human to want to mark their territory. Once seen, I noticed it everywhere. 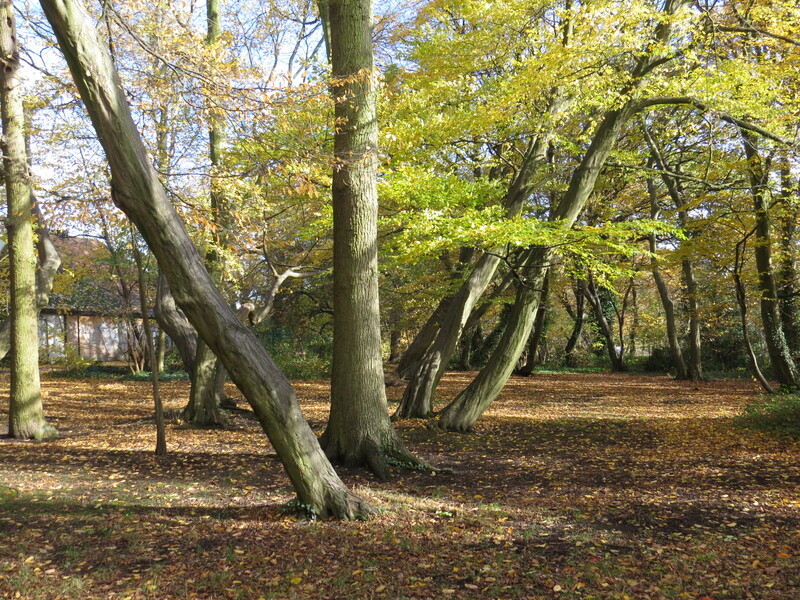 But for the first time I noticed how the hornbeam and oak trees are dancing, their trunks twisting as they reach towards the sun, but on a timescale much slower than our own. What tangos would be captured by a stop motion sequence! They lean back, they swivel, they revolve around their own axis, trying to find a space in the canopy, a dance of years and decades rather than moments, but a dance none the less. And in the main part of the wood a huge oak rises from a lake of golden leaves. How many autumns has this giant seen come and go? 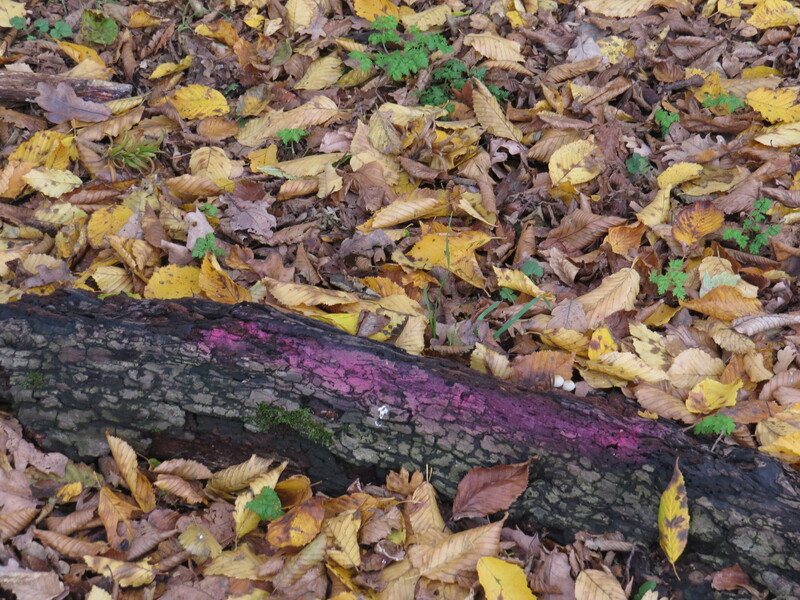 And of the eight autumns that I have had in East Finchley, how come this is the first time that I’ve noticed it? 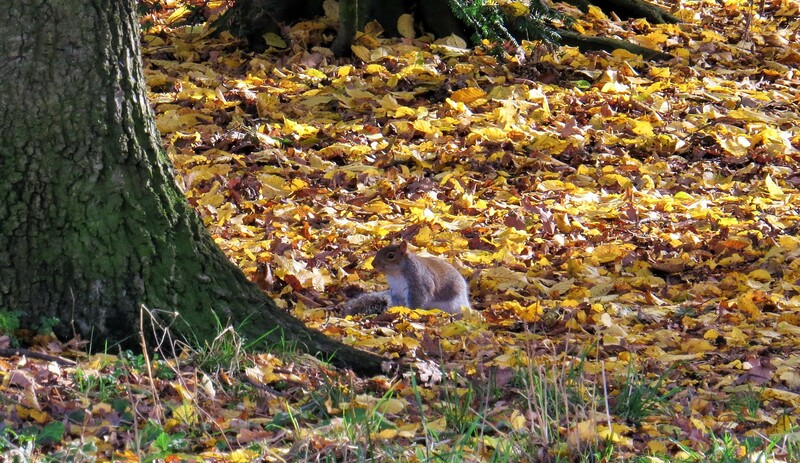 And among the leaves, the squirrels are everywhere. They come in all shapes and sizes, from skinny little runts to great fat imperial squirrels. Most of them are carrying an acorn in their mouths, and they will bury their prize in the ivy or under a layer of oak leaves. Some tiny proportion of the nuts that they don’t eat during the winter will germinate, some of them far from their parent tree, and the dance towards the canopy will start all over again. Turning dizzy laps in the woods is a small white dog.He skids past me, leaves flying in all directions, and heads back, ears flapping, tongue lolling. He hurtles along the path and increases the diameter of the circle. I don’t know where his owner is, but I sense they are somewhere at the epicentre, like the sun. I catch glimpses of him as I walk on through the woods. Once, there would have been deer here, but today he seems like the spirit of the place, a dishevelled London pooch, full of life and spirit. And when I stopped to film the falling leaves, there he was. 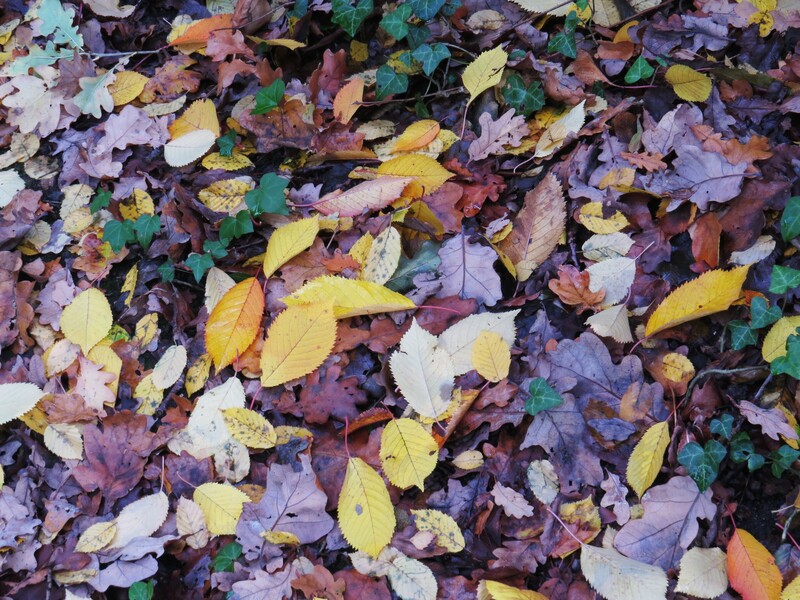 There is so much to be said for a slow, careful walk in autumn. The colours, the movement, the smell of burning leaves and damp vegetation, the call of crows and the whistle of starlings all serve to remind me that outside my poor, overworked brain there are other lives going on. However lonely we might feel when tough times come to visit, we are part of something so much bigger. 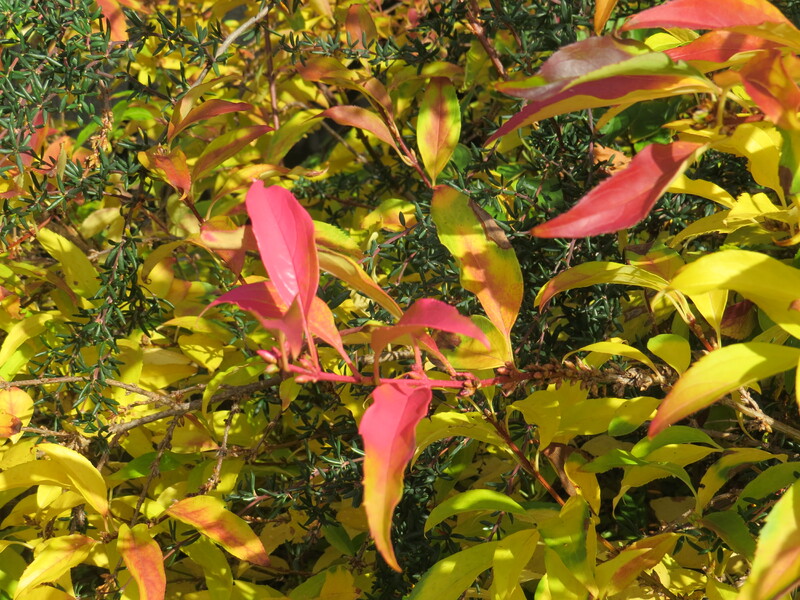 This entry was posted in London Mammals, London Places, London Plants on November 17, 2018 by Bug Woman. Once again you have taken some amazing photos, the colours this time of year are breathtaking but there is also something magical when a tree loses it’s leaves too, we’re always gazing up into the canopies with the bonus that you can spot the birds so much easier. 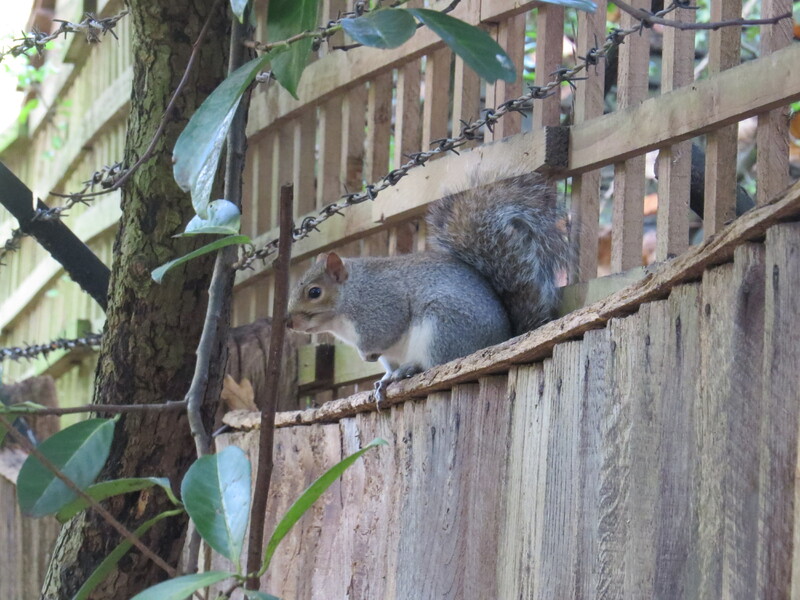 We too have lots of lovely squirrels, three of which are always waiting on their log for us as we take them monkey nuts every day,we often say it would be wonderful to have their agility. So glad that once again you are enjoying your walks, you so absolutely deserve to. 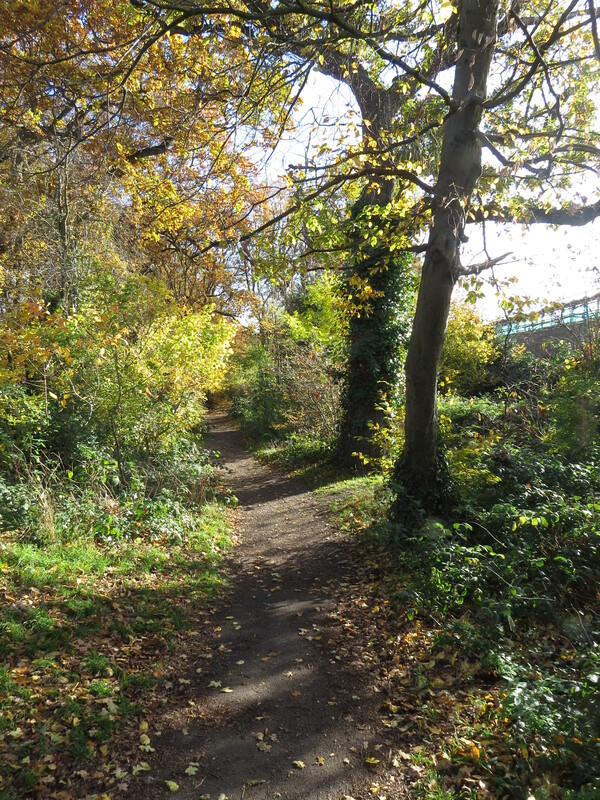 Wonderful pictures – Glad you are enjoying your walks again. Just written about my walks over at my place funnily enough, as what I’ve been doing as a “stress buster” throughout my own difficult time. I think I understand what you mean about the loss of a layer of skin. I’ve felt that acutely too. Also I find myself constantly troubled by the situation we’ve found ourselves in, but know there was no other option. Maybe it gets easier and becomes the new norm. Hope so anyway. Beauty makes me cry far more often than sorrow ! Your blogs share your joy in nature – a thing of beauty itself ! This is a beautifully moving post that seems to capture the whole cycle of life Vivienne – and I do love that little spirit of the woods and his exuberance as he ran among the trees! It’s always good to read about your visits to Cherry Tree Wood, as it’s somewhere I know. 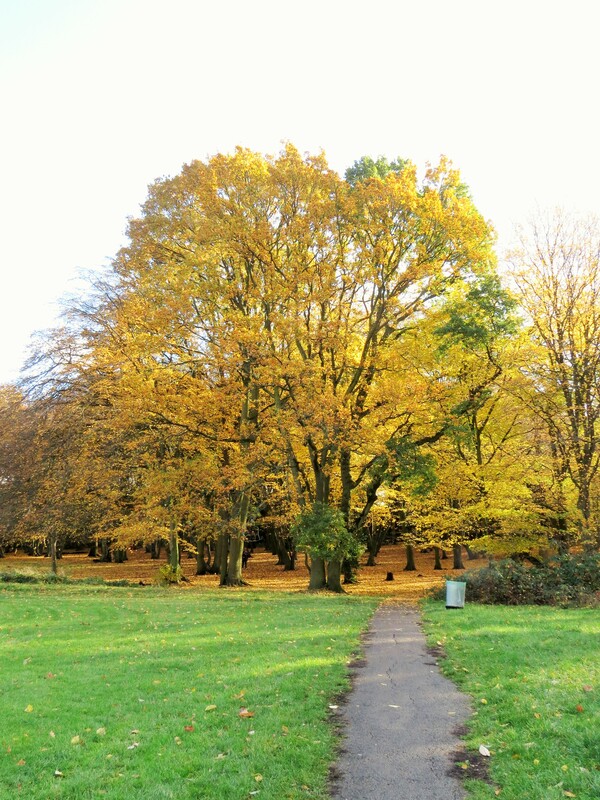 Your gentle autumn walk certainly contrasts with my last visit, on a hot, late summer day a couple of years ago, when the wood was full of people queuing for ice creams and then retreating under the trees in search of shade. 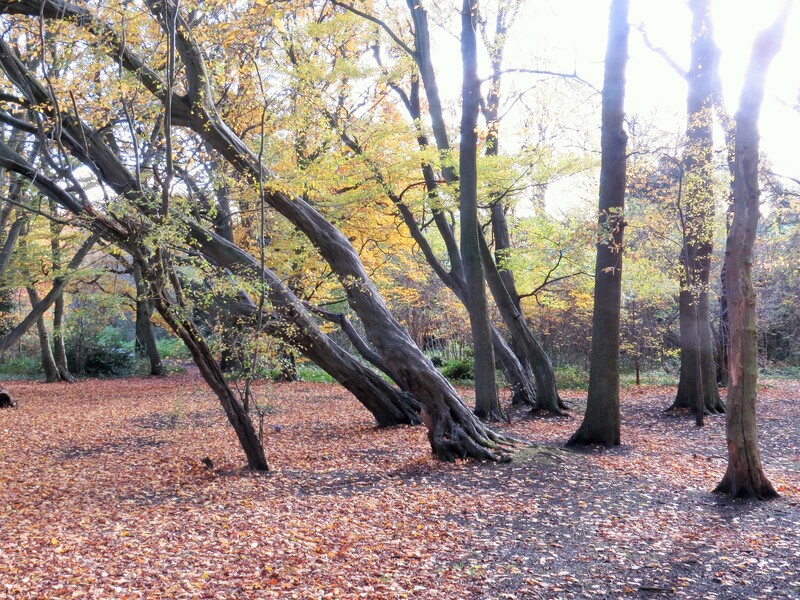 You’ve inspired me to arrange a visit to my local wood before the autumn colours fade. 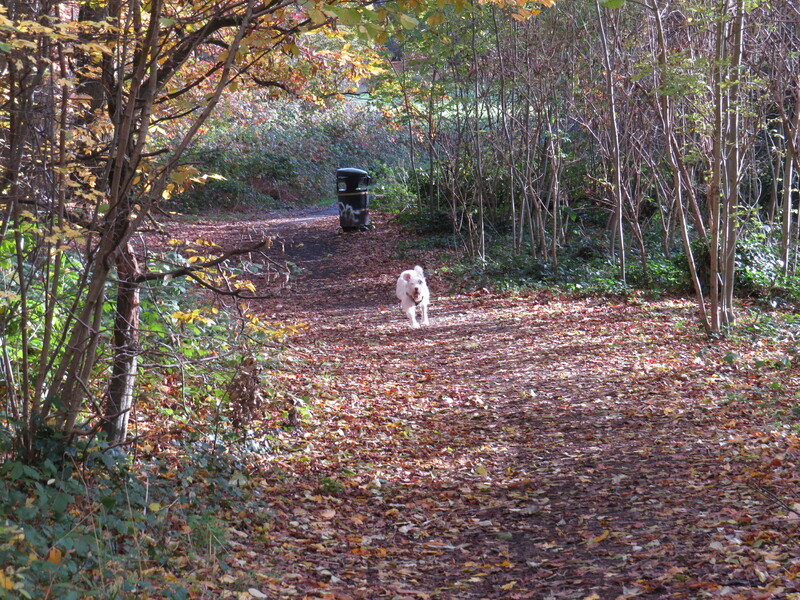 I’ll be going with a friend whose mum died a week ago – I think a woodland walk could be exactly what she needs. Another interesting post, thank you again.